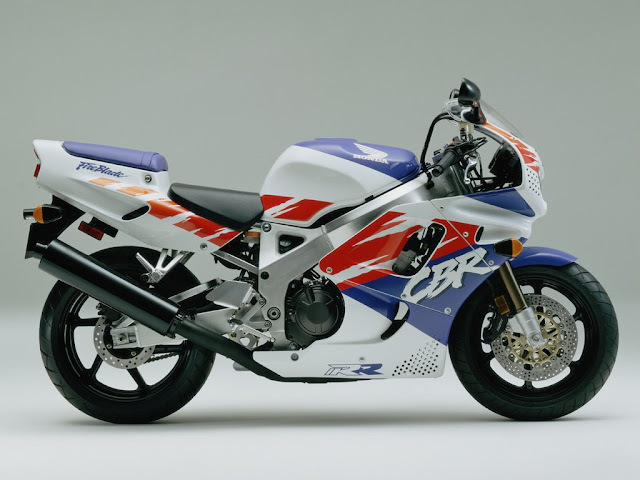 The 'buzz' surrounding the 'Fireblade' - on its 1992 release - was electric! In the unlikely event that you saw one standing still, it was sure to be be engulfed in a sea of onlookers. Months of hype had induced a feeding frenzy of interest in the new bike. The Blade screamed "street-fightin' bike"! Squat - and barrel-chested - it looked like it would be up for it at the drop of a hat! Steep steering geometry - and a super-short wheelbase - meant the Blade cut corners to ribbons! Suspension was suitably 'firm'. 407lb dry was featherweight for a bike of its size. When 124bhp was factored in to the equation, the result was a top speed of 165mph. No doubt, the holes in the fairing helped, too! The Blade was adorned with eye-catching graphics. The beefy frame - and braced swing-arm - signalled the strength of the cycle parts. The sunken seat - and bulbous tailpiece - lent rock-solid support. The CBR900RR - the Fireblade - was, in essence, a superbike all-rounder. Hats off to Honda - that was a heck of a hard trick to pull off!